Zen WP 10 out of 10 based on 4 ratings. Zen WP is a company offering WordPress support. The company is based in the US, with developers working remotely across the US and in India. The company has been in business for around 2 years now and work with clients all over the world in need of any form of support for their WordPress websites. The company’s management team are located in Southern California. They have developers and account managers working remotely across the US, and some specialist team members working out of Bangladesh and India. Their target customers are businesses and entrepreneurs with WordPress sites, but not the time, resources, or expertise to manage the site efficiently. Currently, around 80% of their customers are in the California, Las Vegas and Arizona areas local to their business. This is because a lot of their customers make contact after seeing local advertisements or being referred by existing customers. Offering online support, ZenWP.co is able to offer support to customers all over the globe. So regardless of your location if you need WordPress support you should make contact to discuss your requirements. Zen WP offer support for just about any task related to WordPress you will come across. This includes minor CSS work, changes to the design of the site, bug fixes, and support for maintaining and updating your site. Since downtime on your website can be costly to your business, Zen WP recognizes this and aims to fulfill all requests within 24 hours to minimize disruption. Some of their packages include site maintenance, so a lot of bugs and potential security risks can be identified and resolved before they become a problem. I sat down with Zen WP co-founder, Phillip Koo to discuss what Zen WP is all about. VAA Exclusive: Use coupon code VAATENOFF for 10% off any support plan for life! Zen WP offer three different monthly packages, and all of these plans are valid for only one website. 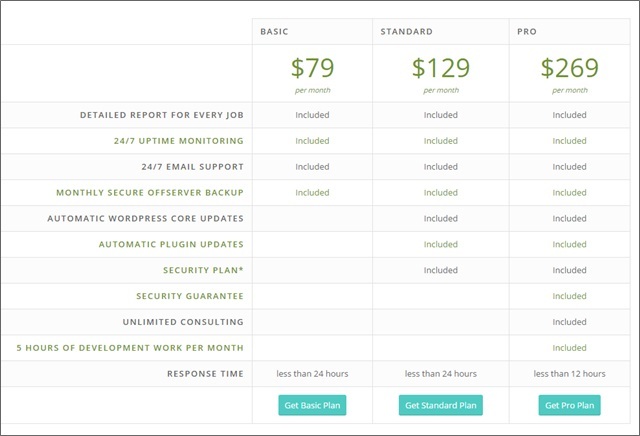 Basic – $79 per month – This package includes detailed reports for jobs completed, 24/7 uptime monitoring, 24/7 email support, and a secure backup of your site monthly. Standard – $129 per month – This package includes all the services in the Basic package, along with automatic updates for your WordPress site, automatic plugin updates, and a security plan. Pro – $269 per month – This package includes all the services in the Standard package, along with a security guarantee, unlimited consulting, and 5 hours of development work per month. Zen WP also offer single job service costing $69 per job. They guarantee the job will be completed in 24 hours, and if for any reason they can’t fulfill your request you get your money back. All of the Zen WP’s monthly packages or one-off payments have no contracts or setup fees attached. You can cancel at any time. Another service to check out if you need WordPress help — but feel like the ongoing maintenance might be overkill — is Codeable.io. Zen WP specializes in WordPress support, any company that specializes in a specific niche often offer a more detailed level of support so it’s worth making contact to discuss you needs and see how they stack up against other virtual assistant providers. Have you worked with Zen WP? If so please leave a review below to help others with their decision. I use Zen WP for my client(s)’ sites. Truly indispensable, especially for freelance web developers that need that extra helping hand, expertise, etc. Conrad, Prateek, Phillip, Jamie, Nhu. They’ve all been super amazing to us. This review is very overdue given how ZenWP helped us stabilize our site within the first month. We had numerous problems that I kept sending to them and they all handled them very well. 5 months using them now and their service is always the best. Nobody knows WordPress better than Jenn. I’ve been testing Zen WP on their $79 per month plan, which includes 24/7 support and “unlimited” quick tasks for ONE domain. And actually it’s been a very meta trial so far since it’s the VAA site they’ve been helping out with. I’ll be honest, I’d been wanting to test a similar service called WP Curve, but they had a 3-month minimum when you sign-up. Zen WP didn’t, so they got my business. I didn’t know if I’d have 3 months worth of work, if I’d consistently use the service, or if they’d be any good. Well now I can say they are good. My account manager Lauren is awesome — she’s helped me clean up a ton of annoying bugs on the site. So what have we been working on? We’ve made the site more secure and hopefully a better user experience. Is it stuff I can directly pin an ROI to? I’m not sure yet. But I can say it’s been kind of like a weight off my shoulders to have an on-demand IT department. Before — and this may sound familiar — my process was to google how to fix something, and not really knowing php and css, paste someone’s recommended code into my WordPress dashboard, hit refresh, and hope it did what I wanted it to do without breaking anything. Sometimes it worked, sometimes it didn’t, but it always really time-consuming, for these annoying minor problems. Now Lauren (and I assume some behind-the-scenes helpers), take care of that stuff. It’s been pretty empowering and maybe a little addicting. In fairness, a lot of these WP issues stemmed from last summer’s theme change and redesign. If you’re 100% happy with your site and it works as you’d like it to on all devices, obviously you should save your money. But if you’re like me and are always finding bugs and making DIY tweaks, these guys are well worth it.